Godzilla Vs Kong has added another member to its growing cast. 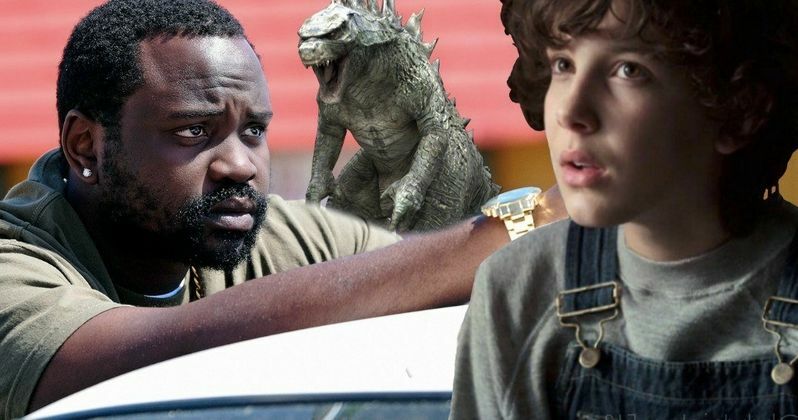 Brian Tyree Henry, star of FX's hit series Atlanta, has signed on to play one of the humans in the upcoming mega-monster showdown. Details regarding his role haven't yet been specifically revealed, but it's said that Henry will have a significant part to play in the movie. Henry joins a cast that already includes Stranger Things star Millie Bobby Brown and Deadpool 2 breakout Julian Dennison. Millie Bobby Brown is also set to star in next summer's Godzilla: King of the Monsters, which serves as the sequel to Gareth Edwards' 2014 Godzilla. Brown will help provide some connective tissue between the installments. It's unclear at this time if any other human characters from the upcoming movie, which is directed by Michael Dougherty (Krampus) will also be making the jump to watch King Kong and Godzilla duke it out. Much of that will likely depend on who makes it out of the next movie alive and knowing that ahead of time could venture into spoiler territory. Beyond knowing that the two titans of monster cinema will be facing off against one another, plot details for the movie are currently being kept under wraps by the studio. Brian Tyree Henry is very much a star on the rise at the moment. He was recently nominated for an Emmy for his work in Atlanta season 2. Henry also earned a nomination previously for his work on NBC's hit series This Is Us. On the big screen, Henry is set to star in Barry Jenkins' upcoming If Beale Street Could Talk, which is positioned as an awards season hopeful. He also was recently featured in White Boy Rick alongside Matthew McConaughey and will star as a lead alongside Aubrey Plaza in the upcoming Child's Play remake, which recently kicked off production. Godzilla vs. Kong should still easily be his biggest movie to date. Godzilla vs. Kong will be the fourth movie in Legendary Pictures' MonsterVerse, following Godzilla, Kong: Skull Island and Godzilla: King of the Monsters. Next summer's upcoming entry is set to introduce some other classic Toho monsters into the mix, including Mothra, Rodan and King Ghidorah, who were all glimpsed in the first trailer that was released over the summer during San Diego Comic-Con. So far, the movies have proved to be quite successful, with Godzilla earning $529 million worldwide, and director Jordan Vogt-Roberts' Kong: Skull Island doing even better with $566 million. Adam Wingard (You're Next, Blair Witch) has been tapped to direct the movie, which could begin production soon. Godzilla: King of the Monsters is currently set to arrive in theaters on May 31, 2019, with Godzilla vs. Kong coming our way a year later on May 22, 2020. We'll be sure to keep you posted as any new details on the project are made available. This was first reported by Variety.